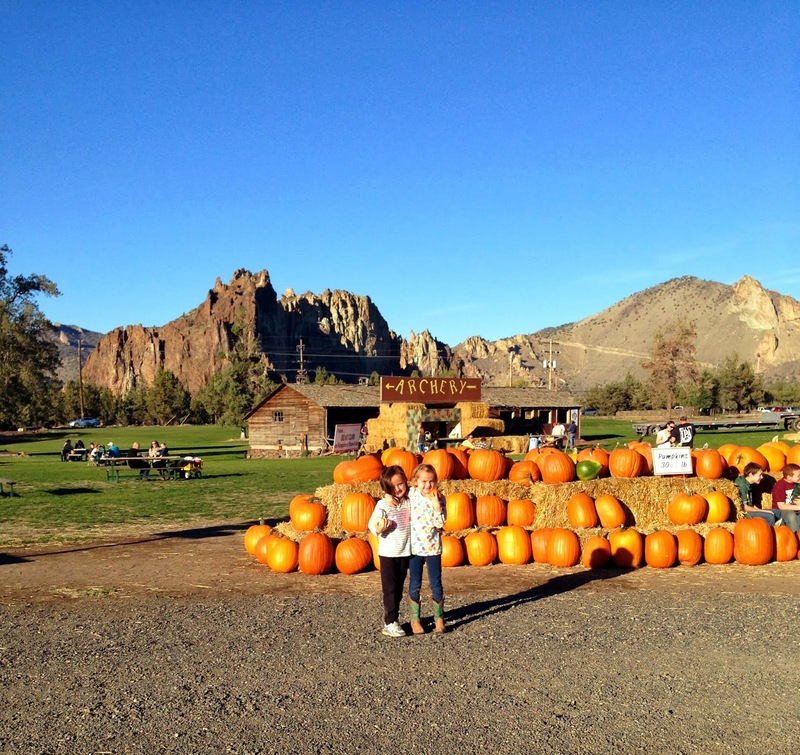 Below is a picture of my goofy girls at Central Oregon Pumpkin Co., with Smith Rock State Park in the background. After more than ten years, I am still in total awe of where I live. Every season brings its own spectacular beauty. It was a perfect fall weekend, complete with good friends, pony rides, getting lost in a corn maze, caramel apples, a festival downtown and long walks with the dogs! I’m trying to hold on to that blissful feeling as we enter the week with a grey Monday… So hard to self-motivate on days like this! It’s a good day to sit and share a new recipe with you while I have my favorite snack. A fresh, crisp apple with a slice of cheddar cheese. Perfection. 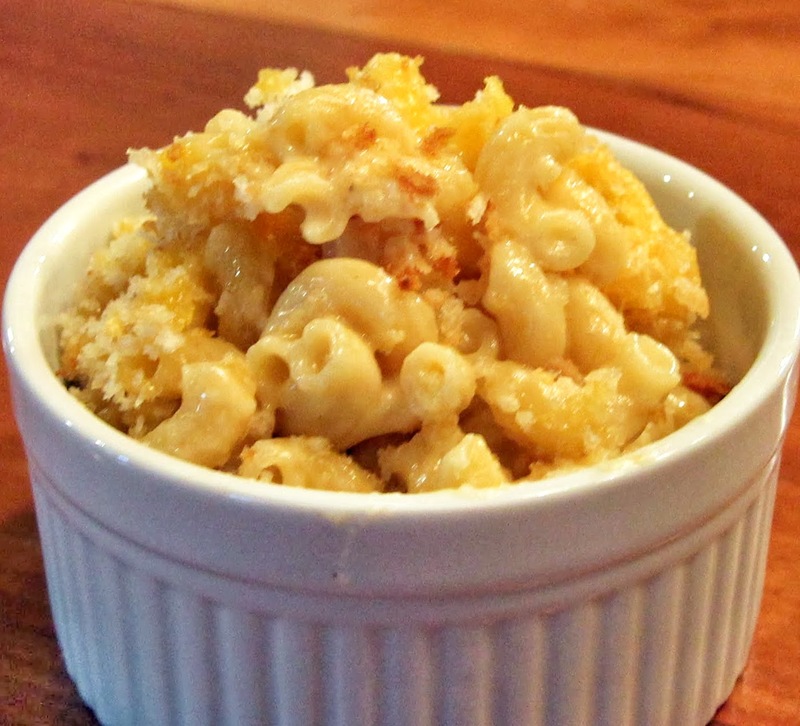 I”m thrilled to announce, after years of resistance, my girls FINALLY prefer my homemade mac and cheese to the blue box with the bunny on it. I thought the day might never come so, if you’re in the same boat, stay strong and be persistent! 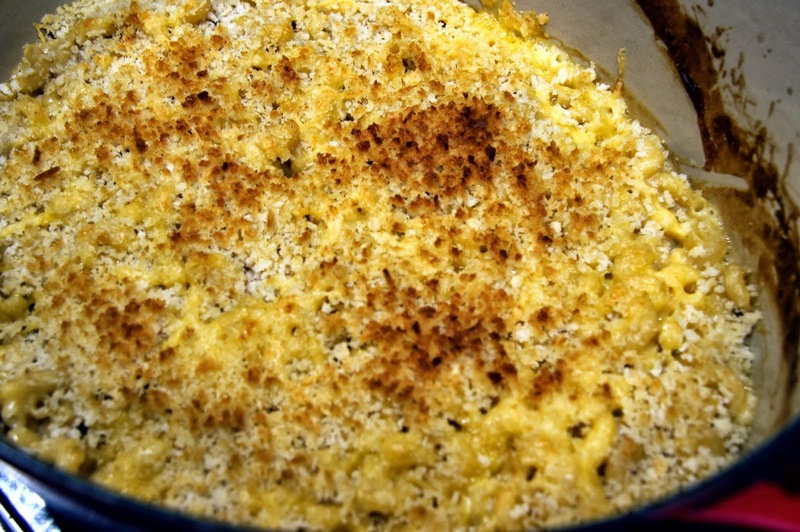 The reason I call this “Weeknight Mac and Cheese” is that the ingredients are slightly lightened up (it’s still mac and cheese, don’t have it every night), and it doesn’t require more than about 10 minutes in the oven. Most recipes have you bake it 30 – 40 minutes but I have a shortcut because I know you don’t have time for that. 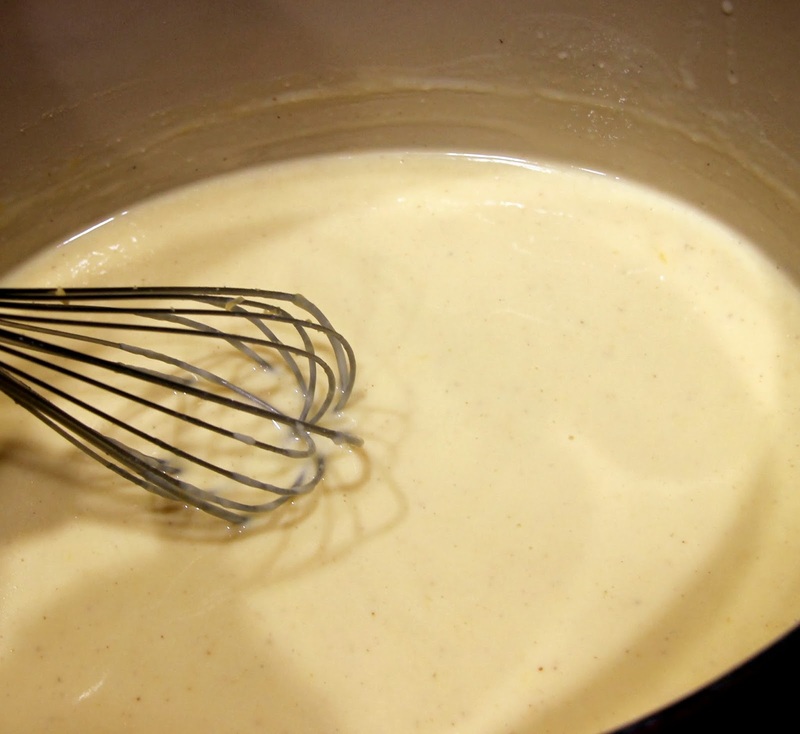 Don’t be afraid of the roux and the making of the sauce – I’m going to take you through it and it’s going to be great. Meanwhile, make your roux in a large saucepan or Dutch oven. 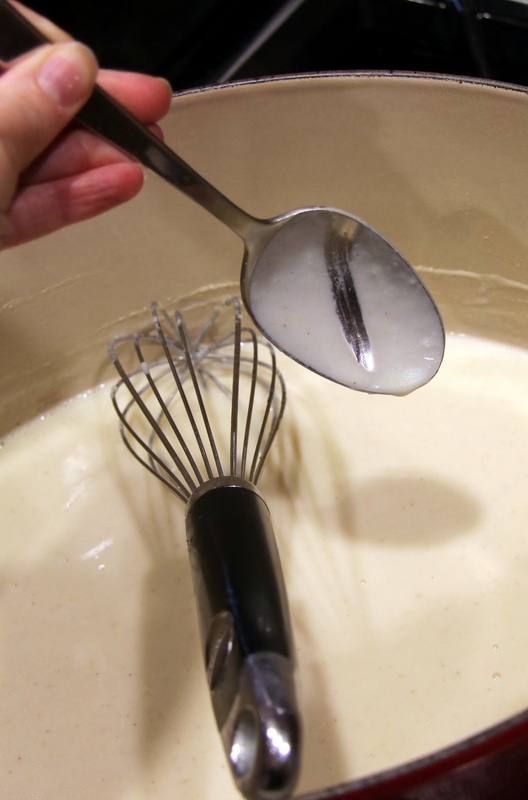 On medium heat, whisk together butter and flour until they form a smooth paste. Stirring often, allow to cook, bubbling slightly, for a few minutes to remove the raw flour flavor. 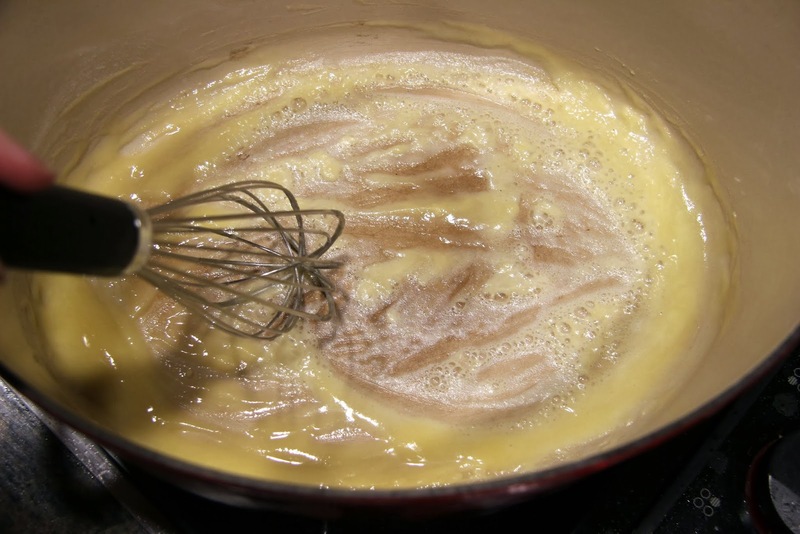 Use a rubber spatula to scrape the sides of the pan and keep the roux together. Very slowly, pour in chicken stock, stirring constantly. 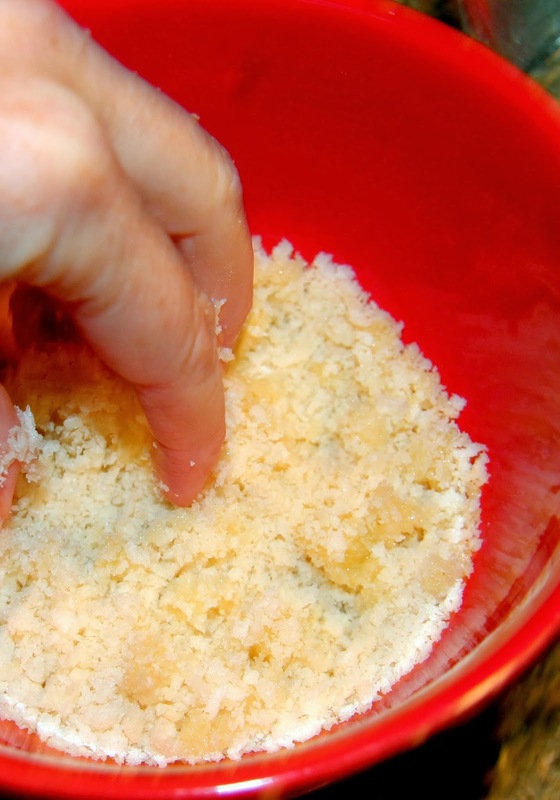 The mixture will seize up at first and become thick and clumpy. Don’t be alarmed if this is your first white sauce – this is normal. Keep gradually adding the stock, stirring until it smooths out. 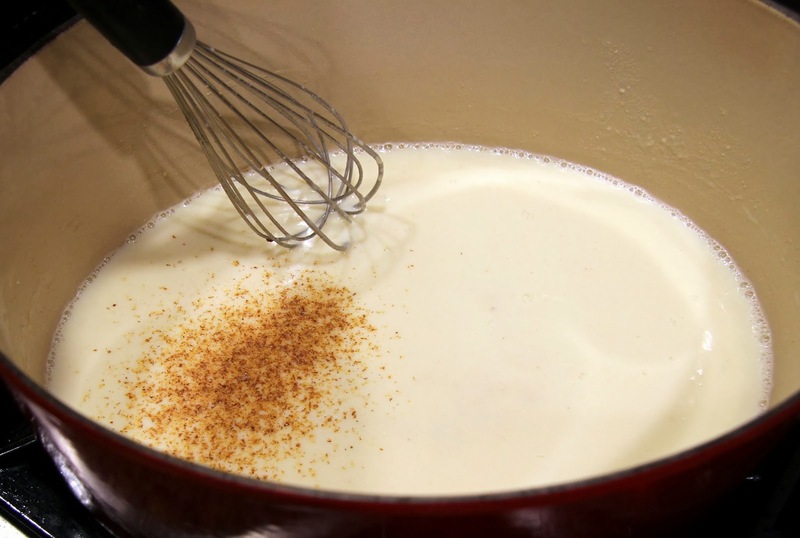 Next, add the milk, again stirring constantly until mixture is fully combined and smooth. 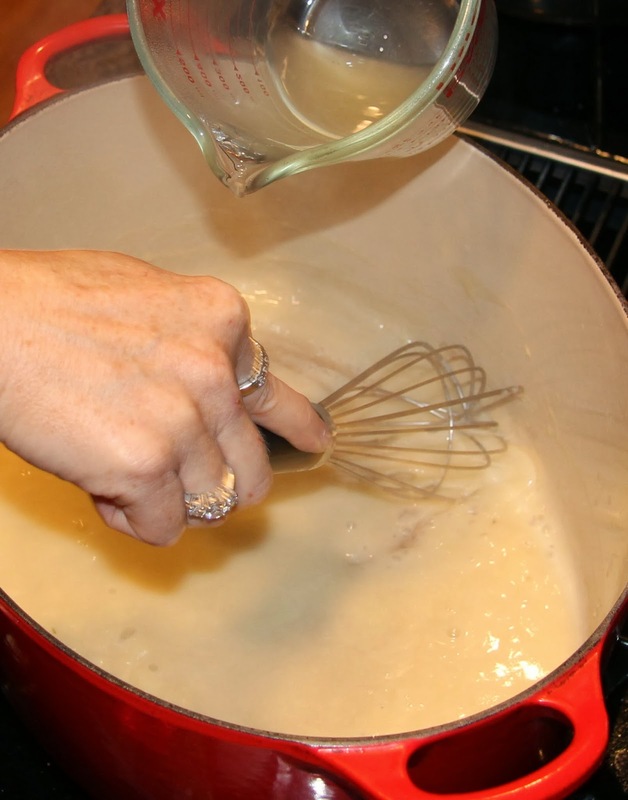 Use a rubber spatula to scrape the sides of the pan where the roux can get stuck. Stir in salt, white pepper, garlic powder, nutmeg, and mustard. 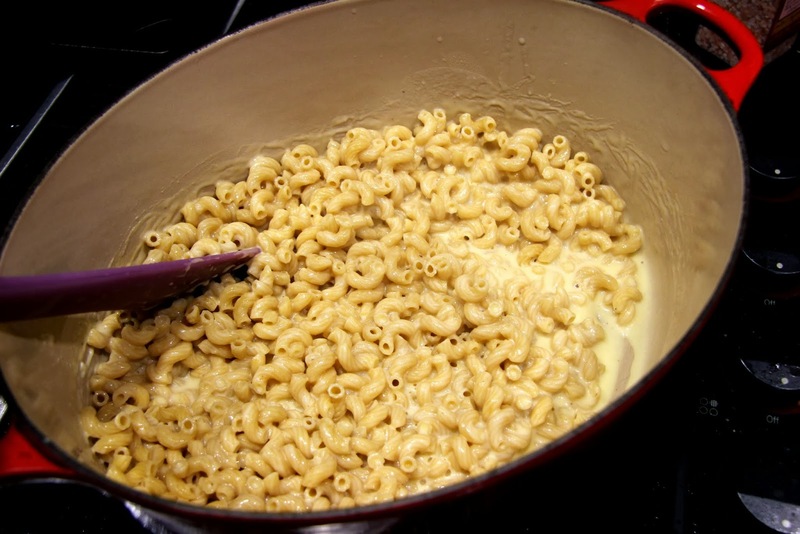 Taste it, if it needs more of something, add it, keeping in mind the cheese will add a salty element. 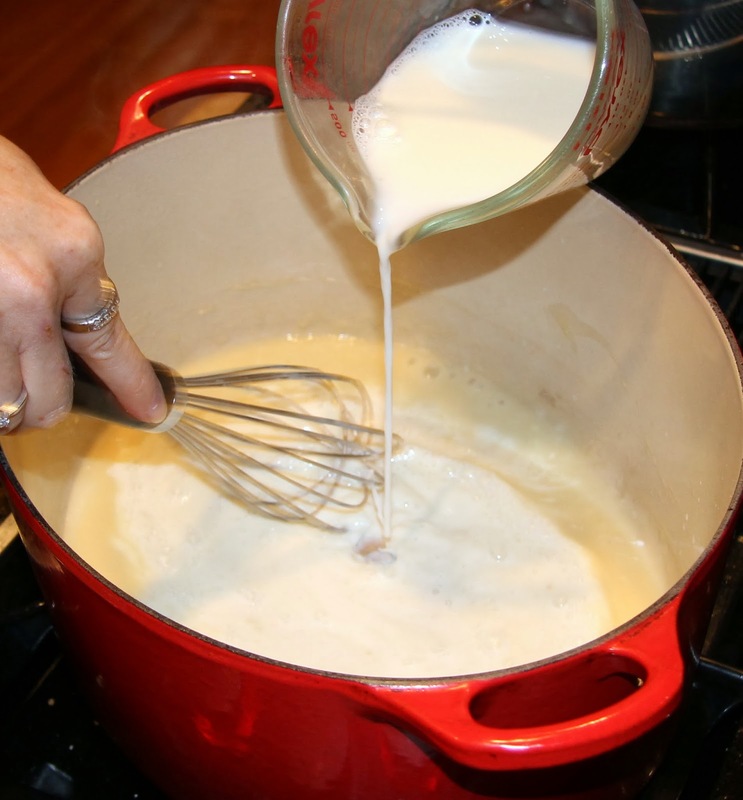 Allow sauce to cook on medium-high heat, stirring almost constantly, until it thickens. 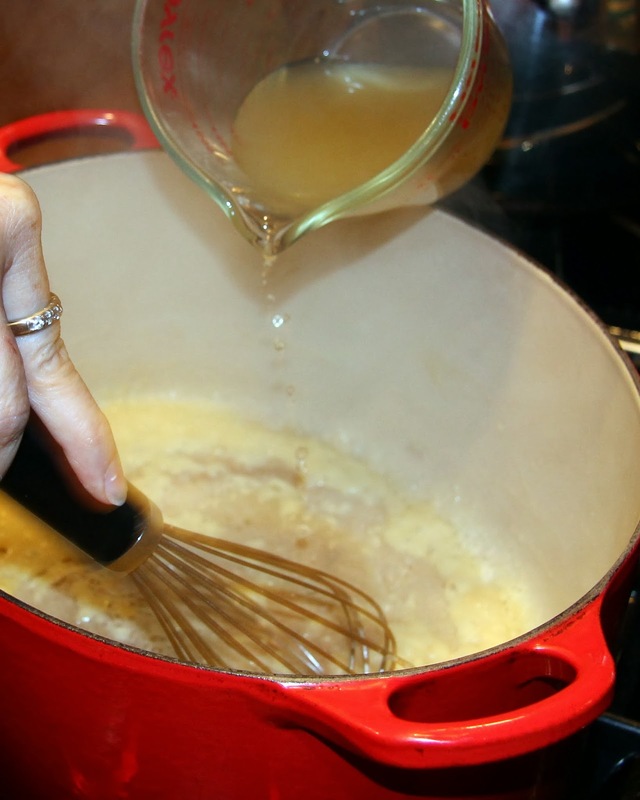 The sauce should be thick enough to coat a spoon and stay put when you run your finger in the center of it, as shown below. 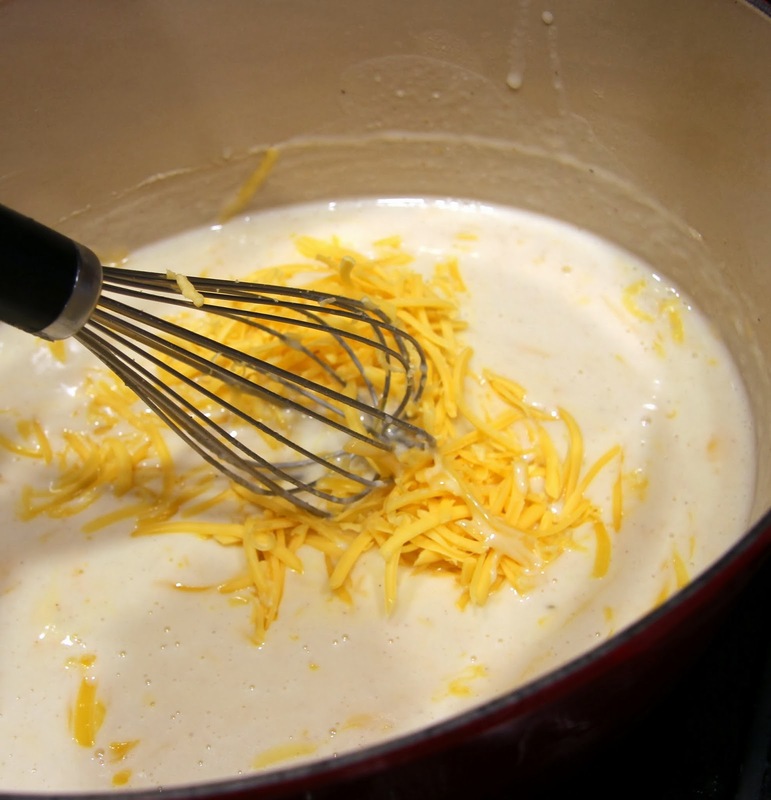 Stir in shredded cheese to the thickened sauce. 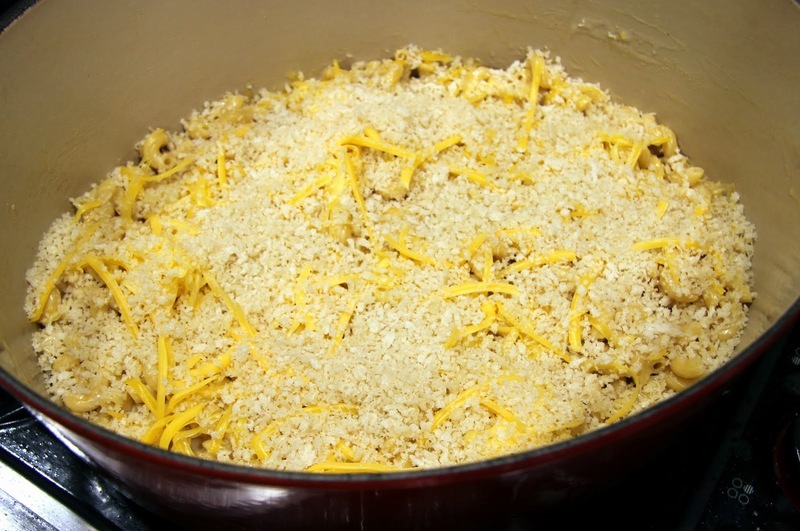 The cheese should thicken it up more right away. Stir in cooked pasta. 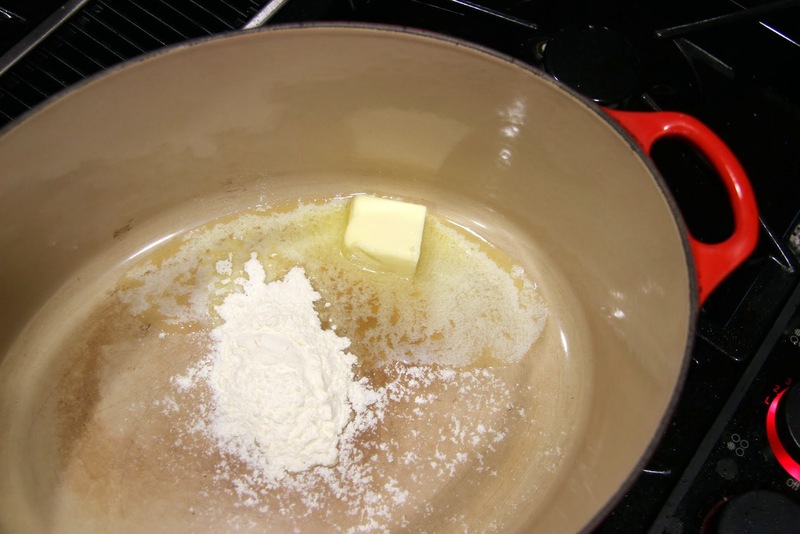 If you are using a Dutch oven, you may leave it in the pan, if not, transfer to an 8x8in or 9x11in baking pan coated with butter or cooking spray. 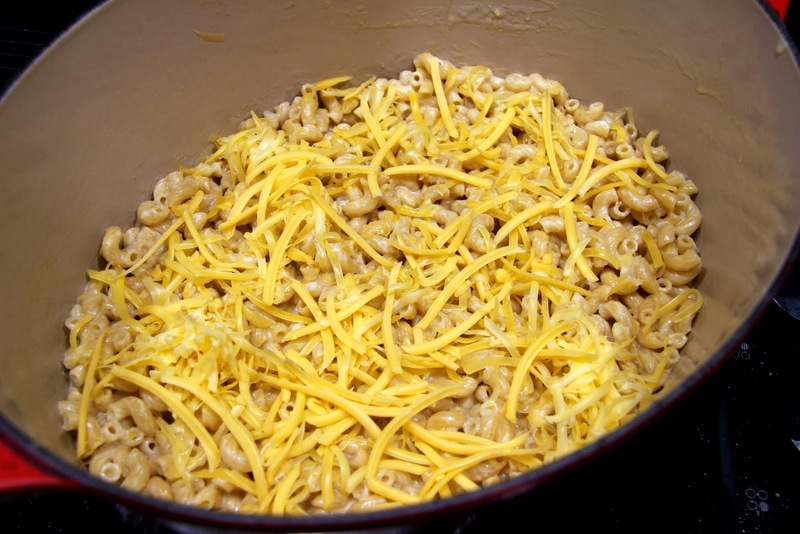 Top with 1/2 cup shredded cheddar. 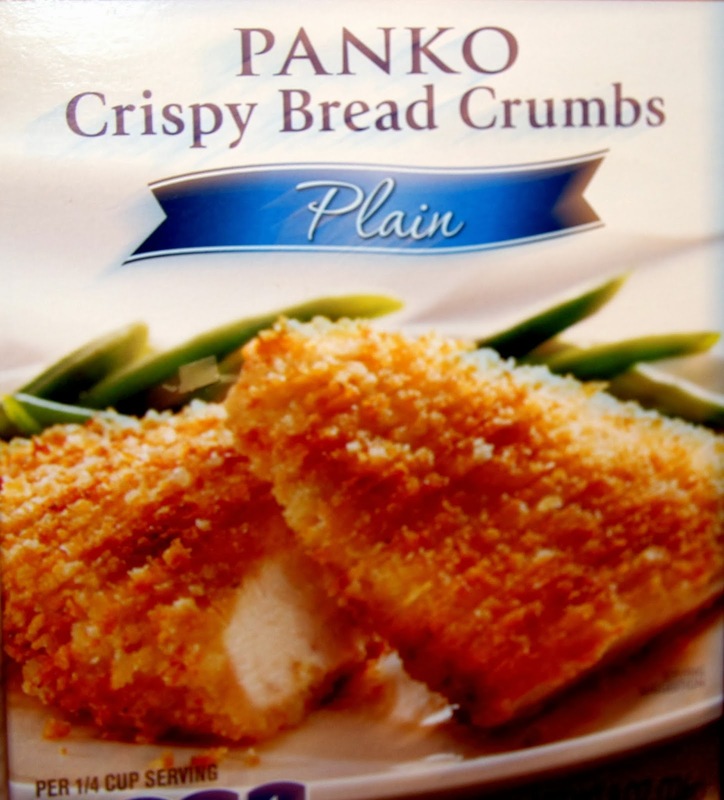 Mix together 1/2 TB melted butter with the bread crumbs. 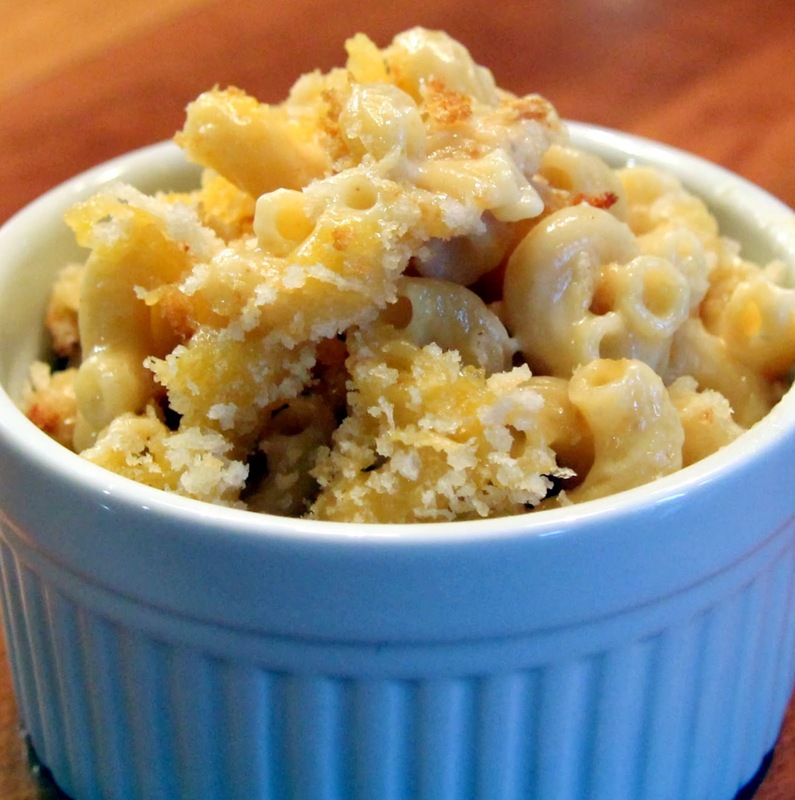 Spread bread crumbs evenly over the top of the mac and cheese. Place in the oven on broil for 5 – 10 minutes, checking every couple minutes, until golden brown and crunchy on top. Allow it to rest for 5 – 10 minutes before digging in. Serve with a big salad or roasted veggies to balance out the meal. I hope everyone in the family likes it!